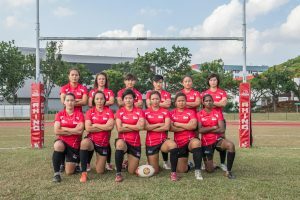 The Singapore National Women’s 7s Team earned their 6th placing in Asia after coming back from an early try from Chinese Taipei in their 12-5 win in the Asian Women’s 7s Championships 2012 held in Pune, India. Singapore were pooled with Asian giants Kazakhstan, Iran and United Arab Emirates (UAE) in the 15 team tournament that doubled as the Asian qualifier for the Rugby World Cup Sevens 2013 in Moscow. Singapore started their first day with a 20-0 win against Iran but soon had their backs to the wall when UAE scored two early tries in their second game to put the Gulf up 12-0. Starved of possession and defending against a physically larger UAE side comprised of expatriates, Singapore struggled to make headway but the republic held fast and made the most of their opportunities to come from behind and close out the game 19-15. The last game of their day went the bookmakers way with Singapore losing 31-0 to Kazakhstan however Singapore’s two wins from the pool after day one placed them in the top eight teams in the tournament. In the playoffs, eventual winners Fiji, were just too strong for Singapore who fell 47-0 to the islanders. Singapore’s bid to move into the 5th-6th playoff began strongly with Singapore drawing first blood against Thailand. The Thais replied immediately off the kickoff to bring the score to 7-0 in their favour but not before both sides scored another try each to tie the teams 12-12 at half time. A lapse in Singapore’s defence allowed Thailand to put in just a single try in the tightly contested encounter. With time running out, Singapore lost their last opportunity to get a score in when a quick throw-in was knocked on and the game ended 17-12 to Thailand. Having beaten Chinese Taipei once in three encounters, the odds were not in Singapore’s favour and history looked like it was going to repeat itself when Taipei were the first on the board. However, Singapore dug deep and pulled off a 12-5 win against Chinese Taipei to place them 6th among the Asian teams. Eventually, only two Asian teams, China and Japan, were able to nab the spots available for the Rugby World Cup Sevens 2013 with the third Asian spot going to Fiji who defeated current Asian champions China in the final.